This article is about the Filipino band. For the dance music producer also known by the alias "True Faith", see Jeff Mills. True Faith is a band from the Philippines, formed in 1991. They have become one of the Philippines' most popular and accomplished bands. The band took its name from New Order's 1987 hit single "True Faith", revealing the group's new wave origins. At first, True Faith mined mid-1980s new wave sounds for its breezy pop formula, but the group eventually ventured further into the Philippine mainstream, firmly embracing middle of the road radio. Under the Viva Records label, the band has 13 best-selling albums. In 1993, a demo tape of the band's song "Perfect", a romantic ballad with jangling guitars and longing vocals à la the Railway Children and the Lotus Eaters, hit number one on the Manila Top 40 radio station 99.5 RT FM. The accessibility of "Perfect" opened the doors to the masses, a much larger crowd than the cult of fans who watched them perform new wave covers in small clubs. Signed to EMI Music in the Philippines, True Faith's 1995 album, Build, was the group's first big smash, elevating it to superstar status in its native land. 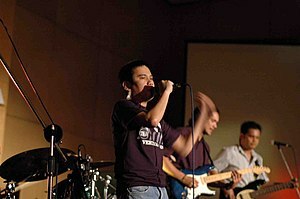 Through the distinct powerful voice of its lead singer and founder, Medwin Marfil, the band was able to amass numerous music awards and nominations highlighted in the summer of 2000 by a Music Television Asia award for Best Video Award for the video "Awit Para Sa Kanya" (Song For Her). Although True Faith didn't win, the nomination brought the band back into the public spotlight. Memories Are Cheap: The Best of Truefaith, 1993-2000 , Produced by Truefaith and Darrell James Laxamana, was also released that year, a hugely successful overview of Truefaith's success and a look at how the group evolved from its new wave roots to becoming an easy listening icon. The album featured a new track "Kung OK Lang Sa'Yo", a one-acoustic guitar ballad featuring then new member Jay Valencia on guitars. This album also includes a remix version of "Get It On". As they toured the Philippines through colleges, club circuits and radio stations, they continued to build a strong following. "Faithfools", the moniker the fans called themselves, look upon the group to hear songs they have popularized like "Perfect", "Sumasarap ang Gising", and "Dedma". Truefaith has played alongside famous artists like The Dawn, the late Ric Segreto, Kuh Ledesma, Kulay and many more. They were slated to perform in the United States in the fall of 2005. The band are mostly popular for singing the theme song for Sa Piling Mo entitled "Dahil Ikaw". This song bagged the Favorite Media Soundtrack category in the 2007 Myx Music Awards. Nevertheless, for many observers, Truefaith's nomination was a welcome boost to a rollercoaster career that dates back to their 1993 monster hit "Perfect", which started life as a demo that spent countless weeks as the no. 1 song on the competitive 99.5 RT Top 40 chart. After riding high as one of the country's top pop bands, Truefaith peaked with their 1995 album Build, which spawned several hit singles such as "Alaala" and "Kundi Rin Lang Ikaw". Build was followed by a messy episode that involved a court case between co-founder and lead singer Medwin Marfil and three founding band members over the use of the band name. An out of court settlement ensued, with Medwin winning full rights to the name. He reformed the band with some old and new members and recorded two more studio albums for the Octoarts-EMI label. In 2006, the band regained its stride with a top-selling greatest hits album and the nomination of the band's video (by award-winning video director Robert Quebral) which put them back on the A-List. In May 2001, at an MTV event in Makati, the band unveiled a new twist in its sound with the inclusion of a three-piece horn section composed of seasoned members of leading big band Ugoy Ugoy. The result is a more organic soul-based sound that veers away from the electronica splashes added by co-producer (and in-demand remixer) Brian Cua in their last studio outing. Grace (2002), the band’s next album was welcomed with lukewarm response. Touted as a return to the pop rock realm, it didn’t quite meet the expectations of fans and even the band weren’t as happy as they were with previous efforts. The single "Dedma" initially made much of a stir with its video that featured FHM cover girl Diana Zubiri. All else fizzled into oblivion. True fans would disagree: they’d argue that tracks like "Come Back Home" and "Medusa" would have made great singles. As Medwin recalls today, the group wasn’t given ample time to polish the record into how it should be. The record company was also undergoing management personnel changes which didn’t help either. He also remembers that aside from Slapshock and other rap metal bands, the band scene wasn’t as vibrant as it used to be. This seeming limbo-like state of the band scene was followed by another music trend, a trend that Truefaith would be a bit player of sorts. In 2004, Truefaith released Eto Hits… Acoustic. Convinced that the band pioneered the unplugged side of OPM in the early 90s, EMI decided to release a compilation of old Truefaith songs in their original acoustic arrangement or re-done to suit the theme. It also included a cover of the Culture Club classic, "Mistake No. 3". The collection did quite well. The video for "Dahil Ikaw" was one of the most viewed in 2006, and was nominated in two categories at the MYX Music Awards of 2007, consequently winning in the soundtrack category. It was directed by Genghis Jimenez. In October 2005, the band went to the U.S.A. for their 1st American Tour. They played two shows around San Francisco, San Diego, New York and two shows in L.A. Medwin believes that the popularity of the song "Dahil Ikaw" has only increased the chances of them going back to America and possibly a tour of Europe to entertain Filipinos there. It is no wonder that the song that ushered their comeback has paved the way for them to play internationally. From 2006 to 2008, they did shows in Taiwan, Hong Kong, Singapore and Malaysia. In June 2009, Medwin and Eugene did a special acoustic show in Dubai which was very successful. To celebrate Truefaith's contribution to OPM and their years in EMI Philippines, the record label compiled all of the band's most memorable hits and other less popular-yet-beautiful tracks. Dubbed as Dream Journal: The Very Best Of Truefaith 1993-2007, the two-disc 32-track album chronicles Truefaith's journey through songs that endeared them to the listening public and cemented the band's reputation as certified hit makers. Truefaith has just recently signed up with Viva Records and is currently recording for the new album. The new album titled, Love Parade for the Life Brigade was slated for an Oct release. According to Medwin, the band is experiencing some delays but reassures all fans of the band that it will be out way before 2009 ends. Released in March 2010, Love Parade features an eclectic mix of special guests from soul prince, Luke Mejares, saxophone wiz, Dix Lucero (on the 80's influenced inspirational track "Kaya Mo 'Yan") and Time magazine-hailed artists Carlos Magno of the band Out Of Body Special and Armi Millare of Up Dharma Down. The latter sings on the upcoming first single, "'Yun Lang". The band signed up with Star Music (ABS-CBN's label) in 2015. In 2017, True Faith received an invitation from MGMT to record their own rendition of the American Indie Rock band's then forthcoming single "Me and Michael," which was eventually included in the latter's new, fourth album, Little Dark Age, released on February 9, 2018. The result of this was True Faith's New Order-inspired Filipino version of the song, titled "Ako at si Michael." MGMT then released a music video of their song which featured True Faith in the narrative. For their part, True Faith came up also with their own video of "Ako at si Michael," which will form part of the new album that they are currently working on. "Muntik ng Maabot ang Langit"
^ TRUE FAITH - Paano Ka Magiging Akin (Official Lyric Video). ABS-CBN Starmusic via YouTube. This page was last edited on 1 April 2019, at 05:50 (UTC).